Hello my beauties! I’ve got another skincare review for you and this time it’s for Nars. I didn’t know that they had a skincare range until I stumbled across it whilst browsing a few beauty sites. If you’d like to know my thoughts, read on for my Nars Skincare review. Just a quick background on Nars skincare. The big skincare company Shiseido acquired Nars and launched the skincare range in 2002. Anyone who knows a little bit about makeup, will know about Nars but I’m not sure many people know about their skincare range. 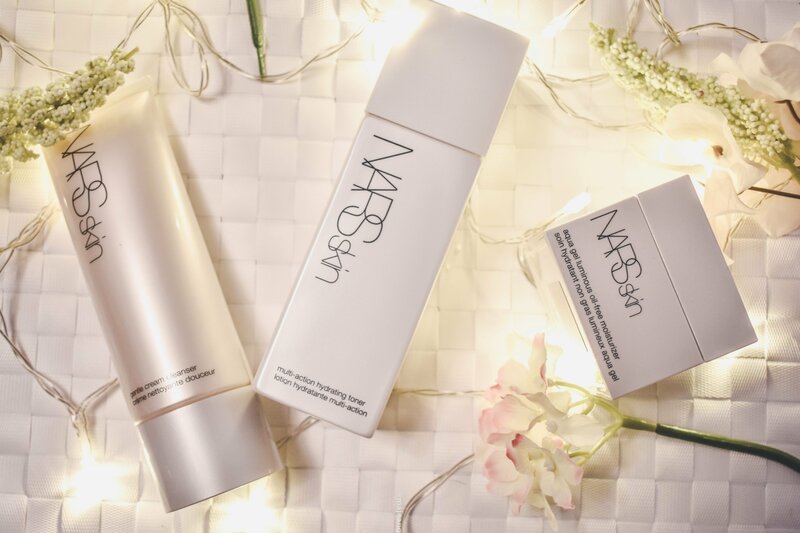 So hopefully this Nars skincare review will introduce you to something you might want to try. Let me start off first by saying that like everything related to Nars, these products ain’t cheap. Yup I said ain’t! They fall within the mid range price bracket and I think the products I bought were slightly less expensive that others. I also purchased mine through various beauty websites during the Black Friday sales. I bought 3 products: Gentle cream cleanser, Multi-action hydrating toner and the Aqua gel luminous oil free moisturiser. It has been about 6 weeks since I have been using these products daily along with my regular serums, sheet masks and the like. As I’ve mentioned before in other skincare posts, my skin is combination/oily with some sensitivity. So I automatically know very quickly if a product will irritate my skin or not. I have to say this cleanser is as gentle as they come. This cleanser is meant to retain skin’s moisture balance and contains monoi oil, wild rose extract and chamomile. I experienced no dryness or flaking after using this cleanser. I also used it as a second cleanse after removing makeup. There’s quite a lot of product and one would hope so given the price tag! A little goes a long way so there’s no need to use a lot of this product to properly clean your skin. There’s no alcohol or synthetic fragrance included in this cleanser, there’s no overpowering scent when using it. It’s very subtle and ‘clean’ smelling. I really wanted to fall in love with this toner because I like to have options. If you don’t know, my favourite toner (so far) is Indie Lee CoQ10 and I keep going back to this time and time again. So when I saw the Nars toner, I thought it would have some competition. Especially after I saw the packaging. I will admit, I’m a sucker for luxurious packaging. Nars claims that it will refine your pores, keep skin soft and prepped for foundation application. It wasn’t bad but, it just left my skin feeling a bit dry which doesn’t bode well in this cold weather. I will say that it didn’t irritate my skin, which is great. As for my pores, the verdict is still out on that one. Okay this oil free moisturiser has to be my favourite product in this trio! Side note: they smell moisturiser with a Z on the product but I’m not about that life. I really enjoy using this moisturiser because it doesn’t leave my skin feeling oily or greasy. It actually feels refreshing when applied to my skin and I have no dryness after being indoors with the heating on. I can imagine this will work wonders during the summer especially if you put it in the fridge. It contains wild thyme for antioxidant protection and sophora root extract to inhibit elastin break down. My skin feels hydrated and I can easily use it with the anti-pollution gel hydrator from Alex Steinherr. It’s such winning combo for my skin and I will be sad to see it finish. Nars Skincare is very chic and luxurious hence the price tag. I would definitely repurchase the moisturiser and the cleanser because it works so well with my skin. That’s all for my Nars Skincare review now I’d love to know if you’ve tried any of these products before? Or, would you try them now? Leave a comment below. As always, thank you for reading and commenting. Don’t forget to subscribe to the weekly newsletter and follow me on Instagram.